Mildred Fay Jefferson died at age 84 just over two years ago in Cambridge where she lived, not far from Harvard Medical School. She was the first African American woman to graduate from that prestigious university, having entered it at twenty years of age. She had previously earned a master’s degree from Tufts University following her bachelor’s degree from Texas College at the age of 16. She went to Tufts while waiting to be old enough to be accepted at Harvard Medical thirty years before “affirmative action” was even a concept. Mildred was the first woman of any race accepted as a surgical resident at Boston City Hospital, the first woman physician at the former Boston University Medical Center, where she taught, and the first woman member of the Boston Surgical Society. Her intelligence was incandescent, but we will best remember her as a friend. Dr. Jefferson was the only child of a Methodist minister and a school teacher, born in 1926, and raised in Carthage, a small town in East Texas. As a young girl, she would ride on house calls in the horse drawn buggy of the town doctor. Her family and the doctor encouraged her ambition to become a doctor. Her family called her “Millie”. No one else did that I ever knew, including us. In 1973 after the Roe v Wade Supreme Court decision struck down all laws restricting abortion on demand at any stage of pregnancy, Mildred considered her original Hippocratic Oath taken when she graduated from Harvard and refocused her considerable gifts. (Link to original Hippocratic Oath, no longer taken by new doctors after a 2,000 year history: Original Hippocratic Oath.) She founded Massachusetts Citizens for Life, and then co founded National Right to Life, becoming first its Vice Chairperson, then Chairperson and then President, overseeing all its activities. In 1980, she formed the first National Right to Life Political Action Committee. If you found yourself in a debate or a battle with Mildred Jefferson, you’d better bring a lunch. Testifying before Congressional committees led to crisscrossing the country inspiring millions with her extraordinary public speaking ability and multiple appearances on national television, including a session on PBS’s Advocates, remarkable for its long term impact. She made her case, none of it “religious”, but logically and relentlessly, Mildred outlined the moral, medical and sociological case against women taking the lives of their pre-born infants. Watching her articulate her deeply held convictions with grace, power and knowledge was the governor of a large state, who had signed into law a bill allowing abortions in that state. So convinced and convicted was he by her compelling arguments, he wrote her a letter. In it, he told her that he had never really considered the full implications of abortion, nor its effects on women and the culture. He deeply regretted his unreflective support for a “woman’s right to choose”, and vowed to do everything within his purview to fight for the unborn, a commitment he kept until the end of his life. As President of the United States, Ronald Reagan could bring considerable influence to bear. As we mark the fortieth anniversary of Roe v Wade on Tuesday with its sad accumulation of fifty five million aborted babies, and we celebrate the life of Martin Luther King tomorrow, Dr. Jefferson represented the confluence of the civil rights of former slaves and women as well as those of the unborn. She was knowledgeable about and a warrior in all these struggles, her certitude was that they were of a piece. She would talk about the racist eugenics advocated by the founder of Planned Parenthood, Margaret Sanger, and how to this day their abortion clinics are located most deliberately in poor and minority neighborhoods. Mildred deplored the undeniable facts that black citizens comprise about 12% of the U.S. population, yet suffer 35% of the abortions. She saw this as a kind of genocide, wherein affluent white liberals saw their moral directive was to “help” minorities by lending them a hand to murder their young. When my wife, Rita, became the Executive Director of Rhode Island Right to Life early in the new millennium, she understood the medical and moral dimensions of the battle, but was naïve on the political battleground. 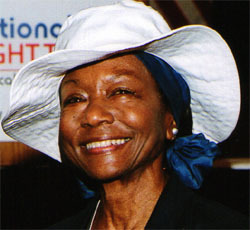 Mildred Jefferson took her under her wing. As a force to be reckoned with in both national pro life activity and Republican Party politics, her mentoring skills were like everything else she did – formidable. She was in her early seventies then, looked fifty, and had a magnificent gift to make you feel like you were the most important person in the universe – the total focus of her attention in any conversation. Over lunches and dinners, we soon learned she could discuss knowledgeably any topic that came up, from the Civil Rights movement of the fifties and sixties to whatever became of the owner of the former Steve’s Ice Cream emporiums in Cambridge and Providence, whom she knew well. Her smile, her laugh, her warmth, her truly startling memory and intelligence were a delight and comfort. Never was there a hint of affectation in her conversation – only a sincere desire to help, to support, to encourage and to befriend. The Rhode Island Right to Life annual oratory contest and scholarship award for high school students is named in Mildred’s honor; the national contest, to which the Rhode Island winner is sent, was a special passion of hers. She supported Rita in many ways throughout her years at RIRTL and sat with us at Rita’s retirement dinner. When Dr. Jefferson spoke at our annual rally in the Statehouse Rotunda, she was mesmerizing with natural speaking ability and gifted intellect; she would let loose the occasional glimpse into the cadences of her Southern preacher father. The entire audience of religious and political luminaries along with school buses full of young people and the hundreds of ordinary pro lifers with their families were rapt with attention and respect for her history. This tiny, unassuming woman who could keep us enthralled around a mealtime conversation, transformed into a speaker of great power. She could even lead us in a rousing few verses of “Battle Hymn of the Republic”, sung with the accomplishment of her childhood Methodist choir days. She was beautiful in so many ways; we hope to see her again. We will miss her at the rally on Tuesday, but even more, we will miss her at dinner. We miss her smile. Ecclesiastes 3:11, He has made everything beautiful in its time. He has also set eternity in the human heart. Link to a commemorative article about her life. Thank you Jack, for focusing today’s blog on one of the pro-life movement’s most influential founders and orators. The fortieth anniversary of the infamous Supreme Court decision, Roe v. Wade, is a difficult one to ponder. The numbers are mind boggling…55 million. The hurt and pain of women and men who made a decision to abort their baby is widespread and no longer debatable. Dr. Jefferson saw this movement as the civil rights movement of our time. She was intimately familiar with civil rights movements. I feel so privileged to have known her and I know she is in heaven praying for all of us, especially for the babies, Moms and Dads. Dr. King would surely have been a kindred spirit had he known her. Having our anniversary fall upon the date of the Roe v. Wade decision is sometimes difficult and sometimes deeply moving. God is good and WILL be the victor. I encourage everyone to listen the NRTL link of tribute to Dr. Jeffeson. It brought me to tears. I forgot to mention that Dr. King’s niece, Dr. Alveda King, a pro-life champion, spoke most eloquently at one of our rallies on the steps of the RI State House and promotes the cause for life around the country. And for those men or women who are suffering from abortion, please Google Rachel’s Vineyard Ministries and/or Silent No More. beautiful tribute to a wonderfully inspiring woman!